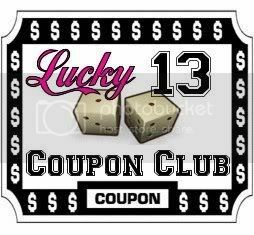 The Lucky 13 Blogs participating are ~Money $aving Michele ~ Clippin’ 4 A Cause ~ Just Married With Coupons ~ Save and Share With Coupons ~ Finger Click Saver ~ Klippin’ Krazy Koupons ~ Tammilee Tips ~ Couponing Journey ~ Frugal Mom of Two ~ Coupon Crazy in Kentucky ~ Another Cent Saved ~A Goddess of Frugality ~ Coupon Cousins. Each member of the “club” is sponsoring $30 or more in coupons for the giveaway. Mandatory Entry is Name & Email (for contact only if you win) and then you are entered to win $400 + (when redeemed) in coupons. US ONLY! This months featured “club member” is Frugal Mom of Two. I do not buy sunday papers anymore. They never have any coupons in them. I just find online ones. Yes we get the Sunday paper just for the coupons. I only get 1. I do buy a Sunday paper that also comes out on Saturday with an Early Edition. I usually buy 2-3. I subscribe to the two local papers for Sundays. Depending on the coupons, I might buy 2 or 3 more copies in the past, but now my lovely co-worker brings me a stack that she has left over from her deliveries (she also delivers papers) – so I'm always clipping some for her too in appreciation. No, but I want to start buying them. I am just getting started on the coupon craze! I buy 2 to 4 Sunday papers. We have a paper delivered and that is all the coupons we get a week. I no longer buy papers we have coupon snatchers around here so all the papers i was getting was missing coupons 🙁 i order mine online now 🙂 thanks for the giveaways.